"To serve the poor and suffering people humbly and without display, and in the name of God, is verily a limb of spiritual sadhana. It helps you remember the Divine and be an instrument in the hands of God for alleviating the sufferings of people." Along with its spiritual activities, the ashram also serves the poor and the needy in many ways, especially in the areas of education and medical care. 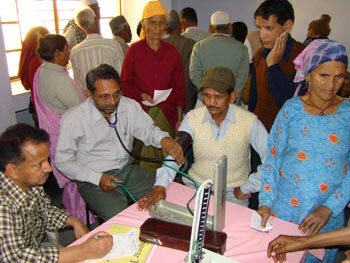 Within the ashram premises the ashram is running a charitable school, as well as a charitable hospital. 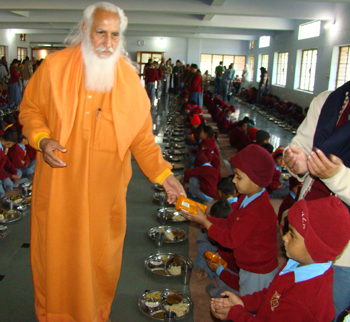 In addition, the ashram does numerous other charitable activities like organizing free medical camps, providing aid and relief during natural calamities, repair and construction of houses for the poor, construction of low cost bathrooms and toilets for the local villagers, public utility works, financial support to needy students studying in other institutions, providing aid and distributing essential commodities and rations to the poor and destitute, running free vocational training programmes in sewing and computer education, coaching classes, etc. The ashram and its various service activities are run through the offerings and donations of devotees and seekers visiting the ashram.